It’s easy to see the recent Spider-man “re-boot”, just ten years on from the previous version, and upcoming re-makes of nineties films such as Total Recall and Judge Dredd as symptomatic of a decreased modern attention span and increasingly unimaginative film industry, but the truth is that Hollywood has always gone through dry spells where it’s been forced to fall back on old successes for inspiration. Shortly after WWII, while some studios were probing dark and exciting new areas with the flourishing film noir genre, and many stars were finally discovering the freedom to pursue more interesting personal projects, Metro-Goldwyn-Mayer, the most successful studio of the pre-war years, was in a firm slump. The quality of their releases had declined as steadily as their profitability, while bureaucracy had increased and the studio lacked a central producer with the creativity that Irving Thalberg had provided in the early thirties. By the end of the decade then RKO production chief Dore Schary would streamline the bloated management structure and the continuing success of Arthur Freed’s musical unit would restore some of the studio’s prestige, but in the intervening years it’s not surprising that the executive committee should see re-makes as safe bets. Among the successes they sought to recreate in this period were Libelled Lady (1936) as Easy to Wed (1946), The Shop Around the Corner (1940) as In the Good Old Summertime (1949), and Grand Hotel (1932) as Week-end at the Waldorf (1945). Grand Hotel was one of the studio’s biggest hits of the thirties, featuring five of their brightest stars, and a remake in the relatively creatively moribund post-war period seems somewhat ill-fated. Certainly the aforementioned Easy to Wed and In the Good Old Summertime were alarmingly pale imitations of their predecessors – in large part due to MGM’s depleted star roster. Once boasting “more stars than there were in the heavens”, their 1940s line-up resembled the kind of heavens you might glimpse through a haze of pollution in a well-lit city centre around 9.30pm. This was an era in which actors such as Keenan Wynn and Esther Williams could be asked to substitute for Spencer Tracy or Myrna Loy, or boy-next-door Van Johnson might attempt to stand-in for the sublime James Stewart. Given that Grand Hotel‘s chief claim to fame was its employment of five of MGM’s biggest stars at a time when putting more than two in one picture was generally seen as an extravagant waste of resources, it might be expected that Weekend at the Waldorf had little chance to compete. It’s therefore somewhat surprising to discover that it’s actually rather good. The cast, while lacking the box-office clout of the originals, are universally watchable and many of the differences in studio style which may be blamed for the relative inferiority of the other remakes are the precise things which make this movie at times more enjoyable than its predecessor. Whereas In the Good Old Summertime took Ernst Lubitsch’s sensitive and beautifully observed study of life and love in the depression from The Shop Around the Corner and swapped it’s darker and more probing elements for old-time musical numbers and broad slapstick, Waldorf manages to transform some of the more overblown melodrama of Grand Hotel into engaging light comedy. The changes are symptomatic of a deep-rooted change in sensibility, as though the adaptation is faithful in the broad strokes of the plot, there is nary a detail that has not been altered in some way to lighten the tone, or provide an extra bit of comic business. There is a trade-off however – though the film is frequently more enjoyable than its predecessor, it also comes at the cost of emotional resonance. The most obvious change is in the central romance, which in Grand Hotel involved a jewel thief and a ballerina declaring an undying love for each other after a single night together, until one of them unintentionally reneges on the undying part of the deal and the film ends in bitter-sweet tragedy. While expertly played by the charming John Barrymore and the ethereal Greta Garbo, I’ve always found the romance a little too hasty, its sincerity almost trite. 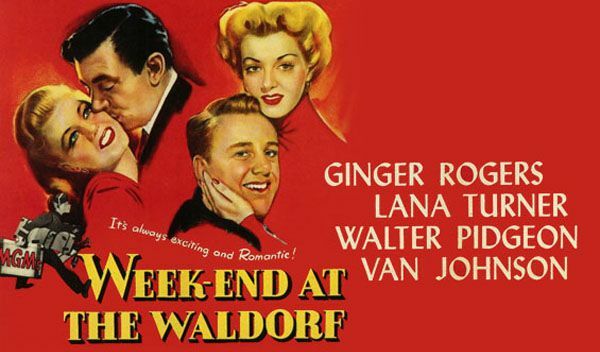 Waldorf‘s romance, by contrast, is drawing on a decade of screwball comedy tropes involving bickering spouses and tempestuous courtships, and the resulting tone is quite different. 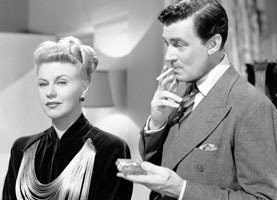 The pair are now a war correspondent on leave and a bored actress, and a shared night in a hotel room this time becomes the cue for a comedy of misunderstanding, with Ginger Rogers’ actress forced to feign marriage with Walter Pidgeon’s journalist to keep up appearances. Though the situation is bordering on farce, the emotions are more human. An initial mistaken identity means that Roger’s relationship towards Pidgeon moves from reluctant fascination, to indignant attraction, to forced domesticity, to eventual longing and mutual love. As a romantic plot it’s far more engaging, but it lacks the hauntingly doomed quality of the original and individually the characters seem more trivial. Pidgeon’s sleep deprived war correspondent provokes none of the pity of Barrymore’s desperate thief, and Rogers’ apathetic film star doesn’t even attempt to plumb the depths of crippling insecurity which provoked Garbo’s most famous line: “I vont to be alone.” It’s a more interesting relationship between less interesting people. At times the film seems almost pathologically determined to avoid emotional issues raised in the original in favour of trivialities and this is evident even in minor details. The hotel clerk who in Grand Hotel spends every night at the hospital impatiently awaiting the birth of his first child is replaced by an urbane newspaper columnist who instead frets over the fate of his pregnant dog. The same character, impersonated by humourist Robert Benchley, also narrates the opening and closing of the film, serving the same function as the original’s facially-scarred doctor. Where the doctor is a lonely outsider who observes with some remorse the transience and emotional detachment of the hotel’s clientèle, Benchley’s columnist is a witty socialite who revels in the constant change. The fraudulent deal-making of Wallace Beery’s businessman in Grand Hotel, a last resort to survive the depression, becomes a flippant and unapologetic gamble in the hands of the perennially corrupt Edward Arnold. 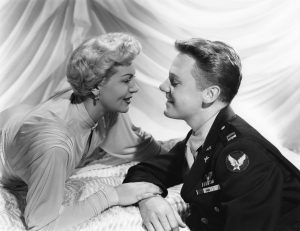 Most importantly, Lionel Barrymore’s terminally-ill, downtrodden working man – a model of sheer pity – becomes fresh-faced MGM ‘golden boy’ Van Johnson, on leave from the army to undergo a life-threatening operation. Though Johnson was not the most charismatic of performers, and it’s something of an indictment of MGM’s waning star quality in the forties that he could ever be considered one of their leading lights, he was always a likeable performer. Perhaps he was not quite up to the job of taking on William Powell’s unscrupulous reporter in Easy to Wed, nor was he an especially formidable opponent for Judy Garland in In the Good Old Summertime, but his innocence and earnest charm is seen to great effect in his embodiment of a homesick small-town soldier in Week-end at the Waldorf. Barrymore’s performance is a virtuoso one, but at times the self-pity and relentless insecurity of his fragile character can seem overbearing, and Johnson’s pragmatic contemplation of his possible impending death is something of a refreshing contrast. His fate is not as certain as Barrymore’s and it becomes a prompt not for one last act of selfish indulgence, but for a reflection on his achievements and a longing to leave something substantial behind. He also enjoys a romance with stenographer Lana Turner which is markedly different from the relationship between Barrymore and stenographer Joan Crawford in the earlier film. There, Crawford ultimately settles for Barrymore out of what appears to be a mixture of pity, affection and unfortunate circumstance. Here, Turner seems to be driven by affection only. Like her character in Ziegfield Girl (1941, also directed by Week-end at the Waldorf‘s Robert Z. Leonard), she initially dreams of a Park Avenue apartment and isn’t too particular about how she gets it, but this time she is spared the unsatisfying realisation of her goal and subsequent decline into abject poverty, and happily makes the right decision before compromising her moral character – as Crawford seems willing to. Turner’s is perhaps the only character in Waldorf forced to struggle with a moral decision; the changes made throughout the story all seemed designed to protect the characters from their darker instincts, and promote a more sanitized and optimistic vision of human interaction. Taken on its own it’s a reasonable and often successful approach, though when viewed in the context of MGM’s changing sensibilities it’s hard not to view it as part of a progression from the often interesting though sometimes pedestrian output of Thalberg’s era, to the largely pedestrian and seldom interesting output of MGM’s later years. One important difference I haven’t touched on is the inferior production design in Waldorf. The expansive and imposing art-deco sets of Grand Hotel create a stage which is entirely fitting for the heightened emotions of the plot, and there is a sense of place, of universality, of timelessness, which creates moments that linger in the mind even after a Week-end at the Waldorf has begun to fade from memory.